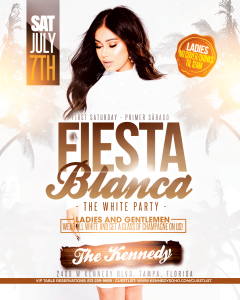 Spanglish Saturdays – THE WHITE PARTY! A mix of Latin classics, Latin-American Remixes flavored with a little Latin house & club bangers! EVERYONE IN WHITE GETS A FREE GLASS OF CHAMPAGNE ON US! LADIES IN FREE & DRINK FREE UNTIL MIDNIGHT! The best Latin night in Tampa with a gorgeous new bar, ragin’ new sound stage, bass pumpin’ new funktion one hybrid sound system for live acts and djs, a bootie shakin’ new dance floor, and the utmost in VIP seating.